If you are instructor in a course that uses Development Economics and wish to have access to the end-of-chapter problems in Development Economics, please e-mail the author at debraj.ray@nyu.edu. For more information, please go to http://www.econ.nyu.edu/user/debraj. If you are a student in the course, please do not contact the author. Please request your instructor to do so.The study of development in low-income countries is attracting more attention around the world than ever before. Yet until now there has been no comprehensive text that incorporates the huge strides made in the subject over the past decade. 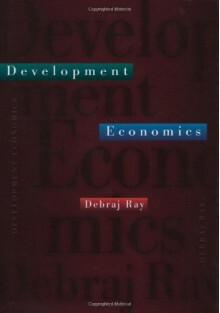 Development Economics does precisely that in a clear, rigorous, and elegant fashion.Debraj Ray, one of the most accomplished theorists in development economics today, presents in this book a synthesis of recent and older literature in the field and raises important questions that will help to set the agenda for future research. He covers such vital subjects as theories of economic growth, economic inequality, poverty and undernutrition, population growth, trade policy, and the markets for land, labor, and credit. A common point of view underlies the treatment of these subjects: that much of the development process can be understood by studying factors that impede the efficient and equitable functioning of markets. Diverse topics such as the new growth theory, moral hazard in land contracts, information-based theories of credit markets, and the macroeconomic implications of economic inequality come under this common methodological umbrella.The book takes the position that there is no single cause for economic progress, but that a combination of factors--among them the improvement of physical and human capital, the reduction of inequality, and institutions that enable the background flow of information essential to market performance--consistently favor development. Ray supports his arguments throughout with examples from around the world. The book assumes a knowledge of only introductory economics and explains sophisticated concepts in simple, direct language, keeping the use of mathematics to a minimum.Development Economics will be the definitive textbook in this subject for years to come. It will prove useful to researchers by showing intriguing connections among a wide variety of subjects that are rarely discussed together in the same book. And it will be an important resource for policy-makers, who increasingly find themselves dealing with complex issues of growth, inequality, poverty, and social welfare.